Of course, Top Gun wasn’t the first major movie of the decade to take the audience deep into the culture of the U.S. Navy’s aviation program. In fact, it wasn’t even the first to star a rising young actor as a motorcycle-riding hotshot who engages on a trope-laden romance and considers quitting after the untimely death of a close friend and brother-in-arms. While the Navy didn’t support or encourage An Officer and a Gentleman, however, it did put its full force into the more escapist and action-packed Top Gun… and it paid off. Supposedly, Top Gun was such an effective recruiting tool that the U.S. Navy saw a 500% increase of young men joining the service in the hope of taking to the skies like Maverick, Iceman, and Goose… well, maybe not like Goose. Of course, it probably also helped that the Navy saw the impact that Top Gun was having on its impressionable viewers and, according to contemporary reporting in the Los Angeles Times, set up recruiting booths in major cinemas to capitalize on the recharged patriotism – and adrenaline – of its audience. Not that they needed to. More than 30 years after its release, Top Gun is still a major force in pop culture, frequently quoted, referenced, and parodied in movies like Team America and shows like Archer. A sequel is even in the works, with Top Gun: Maverick set to hit theaters in the summer of 2020. But even before Maverick and Goose first informed us of their mutual need for speed, the filmmakers needed a star for their project. Tom Cruise was only 23 years old in the summer of 1985, but he had already racked up a reputation as a rising star after a string of early ’80s hits like Taps, The Outsiders, Risky Business, and All the Right Moves. Cruise was initially reluctant to take on the part of Lieutenant Pete Mitchell, but producer Jerry Bruckheimer recalled that the actor quickly changed his mind after the Navy’s famous Blue Angels took him into the skies for an afternoon of barrel rolls. The experience was characteristic of Tom Cruise’s career-long dedication to mastering his character’s on-screen crafts. Maverick’s iconic arrival to Miramar, aka “Fightertown, U.S.A”, finds him cruising in on a Kawasaki Ninja 900/GPz900R as Kenny Loggins’ “Danger Zone” plays in the background. Although it’s a major part of his character, the actor had never ridden a motorcycle until Top Gun, and he went to House of Motorcycles in El Cajon to take lessons from the staff in their parking lot. By the time production was underway, Cruise looked at home on the Kawasaki, which was then the fastest production motorcycle in the world and one hell of a ride for a novice motorcyclist. The military flight jacket now known as the G-1 was developed during the 1930s and found use with both U.S. Army Air Corps and U.S. Navy aviators as early as 1938, though it wasn’t officially adopted until 1940 when the U.S. Navy designated it the M-422A. The U.S. Army Air Force, which superseded the Air Corps, followed suit in 1943 when General Henry “Hap” Arnold discontinued production of the iconic A-2 jacket and adopted this jacket, now designated ANJ-3 (Army Navy Jacket 3). The jacket was standardized as the G-1 in 1947, made of goatskin leather and with a real mouton fur collar, which had not always been found on the wartime M-422A jackets. With the exception of an ill-advised discontinuation from 1979 through the beginning of 1981, the G-1 remained continuously issued to Navy, Marine Corps, and Coast Guard flight crews while the Air Force stuck with the nylon and Nomex bomber jackets that were standardized in the 1950s. The success of Top Gun in 1986 boosted sales of the G-1 among civilians and ensured the jacket’s place in American pop culture. 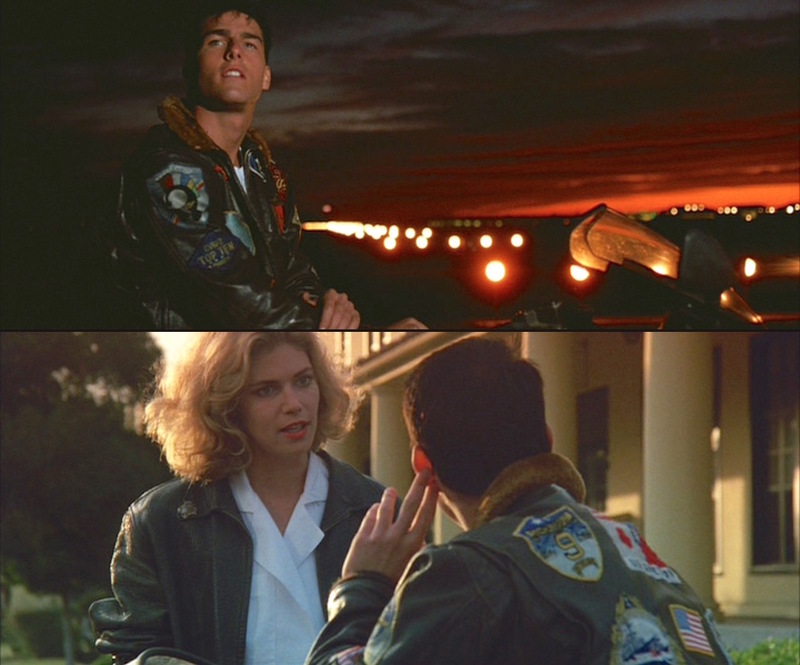 Perhaps after seeing the effect that Top Gun had on Navy recruitment and adoption of its apparel, the USAF reinstated the WWII-era A-2 leather flight jacket in 1988 and it remains authorized for qualified air crews, Missileers, and space operations personnel. Tom Cruise and Kelly McGillis during production of Top Gun (1986). The G-1 flight jacket is constructed from a rich brown cowhide leather, though the original WWII-era jackets were made from goatskin. The real mouton collar from this era, and from the jacket worn by Tom Cruise, has been replaced in recent years by a synthetic fur such as Dynel pile, which Schott uses for their G-1 jackets. Some companies, like Alpha Industries, offer their civilian G-1 jackets with goatskin shells and genuine mouton collars to emulate the classic flight jackets. Other signature details of the G-1 are the straight-zip front, the ribbed-knit cuffs and hem, and the bi-swing back for greater arm movement with a belted effect across the waist. There are two large patch pockets, each with a button-down flap. Many companies offer reproductions of Pete Mitchell’s many military patches, and sites like Wizard Patch were a fantastic resource for seeing exactly which patches were used and where they were laid out. Since the G-1 likely belonged to his father and isn’t part of Maverick’s Navy-issued apparel, he never wears it with his service khaki uniform, summer white uniform, or even his flight suit. With all service uniforms, the U.S. Navy authorizes its officers to wear most white undershirts, whether the fabric is 100% cotton or a cotton/polyester blend and whether the style is a traditional crew-neck shirt, v-neck, or sleeveless. Maverick always wears his G-1 flight jacket over a white cotton short-sleeve crew-neck T-shirt with a large breast pocket with a pointed bottom. When not in uniform, Maverick prefers a pair of classic Levi’s jeans in medium blue stonewash denim. Levi’s has identified them as their 501 Original Fit, and the signature button fly of the 501 can be seen on screen. He almost always wears them with a thick black leather Western-style belt with a big curved steel single-prong buckle, keeper, and tip, all with a matching engraved silver finish, similar to this belt from Brighton. Playing beach volleyball in jeans isn’t the strangest thing about this scene. Not by a long shot. Maverick’s Western-style belt and cowboy boots communicate his cowboy-like nature for the audience, but the boots in particular were also a practical decision made at the studio’s insistence to make up for Tom Cruise’s three-inch height difference when acting opposite the 5’10” Kelly McGillis. The distinctive red, yellow, and green cowboy boots appear to be the same ornate Justin boots that he would wear four years later in Days of Thunder (1990), sold at auction in December 2011 for $2,000. The boots have red shafts, yellow vamps, and green wingtip toe caps, back quarters, and accents. The colors may be indicative of the three colors of a stoplight, with the green most visible to signify Maverick’s oft-quoted “need for speed”. Under his jeans, Maverick wears a pair of white cotton briefs as authorized by the Navy. Even in civilian gear like this dark blue pinwale-corded button-up shirt, Maverick wears his dog tags. Maverick’s Ray-Bans of choice were the brand’s flagship large gold-framed aviators with green lenses. More than 30 years later, the exact sunglasses are still available as the Ray-Ban RB3025 Aviator Classic 001/62, denoting the color code (001) of gold frames with green polarized G-15 lenses and the 62mm “Large” size. Maverick’s Orfina Porsche Design Chronograph fits the Navy’s guidelines for watches to be “conservative and in good taste” with its gunmetal PVD-coated stainless steel case and link bracelet. The racing-oriented watch, powered by Lemania’s 17-jewel Swiss automatic movement, has a black dial with three black sub-dials, an orange second hand, and day and date windows flanking the Porsche Design logo on the watch’s face. Maverick flashes his Orfina watch while setting a date with Charlie. Interestingly, two shots of what is purportedly Maverick’s left wrist show what appears to be a stainless steel Rolex Submariner with a black dial and black rotating bezel on a steel “Oyster”-style bracelet. Both shots are from the same angle during flight scenes, once during the opening sequence and another during the final MiG battle. Based on the glimpse we get of the Rolex dive watch with its lack of date window, I would guess it to be a ref. 5513 Submariner à la Roger Moore and Robert Redford. When dressed for duty, Maverick can be found in one of three U.S. Navy-issued uniforms, the most iconic of which is likely his sage green flight suit, one of which was later donated to Planet Hollywood. These government-issued suits were made from flame resistance Nomex fabric with six zippered pockets on the chest, right thigh, calves, and left upper arm for best access when sitting in the cockpit of an F-14. Since this is part of his actual uniform, Maverick only wears patches that he has actually earned, though director Tony Scott recalled receiving criticism during the production about the unrealistic patches on the actors’ flight suits. Maverick appears to be wearing a U.S. Navy patch, a VF-1 patch indicating service in the Navy’s “Wolfpack” Fighter Squadron 1, a patch indicating service on the USS Ranger (CV-61), an F-14 “Tomcat” patch, and the dark blue ID patch with his name and wings embroidered in red. Goose and Maverick size up their new instructor. Maverick’s most commonly seen service uniform is the Service Khaki uniform, designed to be a wear-round uniform “for office work, watchstanding, liberty, or business ashore,” according to Navy Personnel Command guidelines. The uniform’s khaki short-sleeved shirt is a 75% polyester, 25% wool blend with an open one-piece camp collar on which Maverick wears his rank insignia, a set of double silver bars signifying the O-3 pay grade (Lieutenant in the Navy and Captain across other U.S. military branches.) The shirt also has two patch breast pockets with pointed button-down flaps. Above the right pocket he wears his gold placard with his name and rank; above the left pocket he wears the gold “wings” badge of a U.S. Naval Aviator and two rows of award ribbons. His undershirt is likely one of the same white cotton crew-neck pocket T-shirts he wears with his G-1. The matching flat front trousers have straight side pockets, two jetted back pockets (with a button through the left pocket), plain-hemmed bottoms, and belt loops for his khaki web belt with a well-polished gold anodized buckle. Top Gun often incorrectly features its military officers bareheaded when appearing in uniform outdoors, and Maverick keeps his khaki garrison cap in his right trouser pocket rather than on his head while walking outside on more than one occasion. Maverick also wears the prescribed black dress shoes – a well-shined pair of patent leather oxfords – with black socks. For the brief but iconic scene of Maverick’s first encounter with Charlie while drinking with Goose and his fellow Top Gun students, the pilots wear their Summer White service uniforms, designated for summer only and appropriate as the film takes place over the course of the summer. The all-American Budweiser beer tends to the the brew of choice for our all-American airmen, and it’s this king of beers that fuels Maverick’s ambition as he serenades Charlie with The Righteous Brothers’ “You’ve Lost That Lovin’ Feeling” on the night they meet. Weeks later, after finally landing a date with Charlie, Maverick drinks the chilled white wine she offers with dinner, a chenin blanc from the Charles Krug winery. Charlie tops off Maverick’s glass. Top Gun repopularized the insouciant dressed-down ensemble of a white T-shirt and jeans with a half-zipped jacket, transforming the U.S. military’s half-century old G-1 flight jacket into an overnight fashion phenomenon. Check out the movie… and consider Maverick’s military-inspired look if you need a last-minute Halloween costume this weekend! I really need the shirt! Between “Risky Business” and this movie, I always think of TC as the Patron Saint of RayBan. Must say that I didn’t pay attention to what watch he wore in this film. This was, or course, before wristwatches began getting co-star status in movies. The Orfina PD chronos are nothing to sneeze at, by the way. Haven’t seen “Top Gun” since the ’80s, though. Having binge-watches the first six seasons of “Archer” on DVD recently, I don’t think I can handle ‘danger-zone’ in any way, shape or form right now.